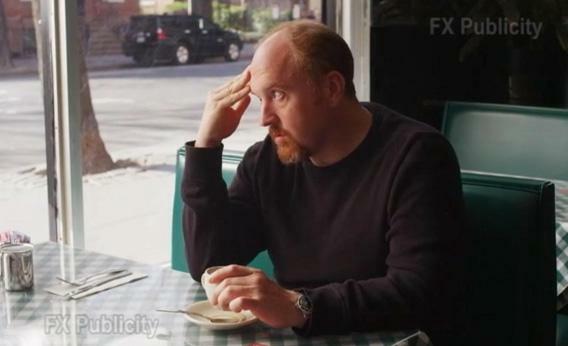 Louie recap: What motorcycles mean to Louis C.K. Can this series do long narrative arcs? Louis C.K. in Season 3 of Louie. So that’s some pertinent back story to the Season 3 premiere. But Louie, as a rule, is not interested in huge, instant turning points. It goes for the small, closely observed moments, like when Louie stares at his ice cream spoon while his much younger, much more mature girlfriend breaks up with herself. Which makes me curious about those extended narrative arcs we apparently have coming. (Apparently the last three episodes of this season will all be connected—and will all feature Jerry Seinfeld.) I, for one, welcome them. As much as I’ve enjoyed Louie to this point, the show needs to move forward, lest it become a dead shark—and the technical ambition C.K. displays when, for instance, trashing an Infiniti and crashing a pretty decent motorcycle on the small budget he gets from FX (in exchange for near-total creative freedom) doesn’t interest me as much. I want to see him tell a longer story. Do I envy C.K.’s way with words, Jonah? All the time. And you can tell how much he thinks about them, about their nuances and complexities—even when he’s not actually using any, as in that brilliant “game of relationship charades.” (Gaby Hoffmann was great—I imagined her character, April, as a grown-up version of the precocious Opal from the stand-up-themed This Is My Life. RIP Nora Ephron.) And that game was echoed by those bewildering road signs, which forced Louie to try his hand at a city-ordinance puzzler (“Parking of vehicles only authorized? Like you can’t park a dog or a carrot?”) and a round of traffic-rules Pictionary (what’s a green circle with a line through it?). The common theme here is a failure to communicate. C.K. is not just an absurdist in the way that, say, Mitch Hedberg was an absurdist. He’s also an absurdist the way Samuel Beckett was one. It’s partly in that spirit that I took C.K.’s casting of a black actress as his ex-wife—whose name, though C.K. couldn’t recall it completely on Jimmy Kimmel Live, is Susan Kelechi Watson. Continuity and narrative logic be damned, C.K. has said again and again when making Louie. Remember when Louie had a brother? He doesn’t anymore. Remember when Louie’s mother was a horrible person who became, late in life, a lesbian? And then remember when she turned out to be a lovely, thoughtful, caring, and as far as I could tell heterosexual woman? C.K. does what he wants with this show. What interests me about the casting of Watson is not the brushback pitch aspect, but where C.K. takes it from here. He told Kimmel that there’s a scene later this season when Louie’s ex-wife tells him “to get a real job. And when a black woman tells you to get job, it’s just more… ‘Get a job.’ It just hurts more.” C.K. has always addressed race with a candor and thoughtfulness that is rare for a white guy. This could get interesting.